Before you get excited, Poke (pronounced “poe-kay”) and the multiple Poke Bars that have sprung up in London of late have absolutely nothing to do with Pokémon Go. Instead of serving slivers of pan-fried Pikachu or mock Squirtle soup, places like Mayfair’s Black Roe Poke Bar and Grill specialise in the Hawaiian dish traditionally consisting of raw fish – generally ahi tuna – served on a bed of short-grained rice. Opened in March, Black Roe is the latest venture from Restaurateur Kurt Zdesar, taking over the former site of seafood restaurant Bouillabaisse. Inside, the restaurant is the sort of glitzy establishment that attracts lots of young women, some considerably older men, and little else in-between. To begin, we chose a seriously refreshing and equally potent cocktail from the remarkably strong drinks list, with an especially impressive wine selection to match. My friend – an ex-sommelier – insisted upon choosing a bottle of Chilean red to accompany the food. Starting with two Poke dishes, one featuring sweet snow crab, the other being the restaurant’s signature ‘Black Roe ahi and yellowtail’ (£8.95). Both dishes were unsurprisingly delectable and seemed especially ideal for a quick, filling working-lunch. With cubes of exceptionally fresh crab and tuna, respectively, served atop slabs of perfectly sticky rice and accompanied by various vegetable trimmings and crisps of fried lotus root to add depth of texture. Thankfully, all of the toppings were subtle enough to avoid detracting too much from the flavours of exceptionally fresh crab and tuna. However, both dishes did boast a mound of unnecessary caviar: an ostentatious ingredient that brought nothing to the dish, other than an inflated price tag, unwanted feelings of guilt and maybe some Instagram credentials. Further expensive ingredients came with lobster and crab pot stickers (£11.50) from the ‘appetisers’ side of the menu. These dumplings were filled with a generous portion of shellfish, though the flavour of the crab completely overpowered the delicate lobster. It’s difficult not to think that the dish would have been just as impressive (if not more so) if the cheaper crabmeat had been used exclusively. Lobster mac and cheese (£29.95) was rather delicious, with tubes of pasta cooked to perfection and rich cheese that had adopted a buttery texture. Conversely, the use of lavish lobster again felt unnecessary – bringing very little to the dish in terms of flavour, especially when paired with the crowning slathering of molten cheese. 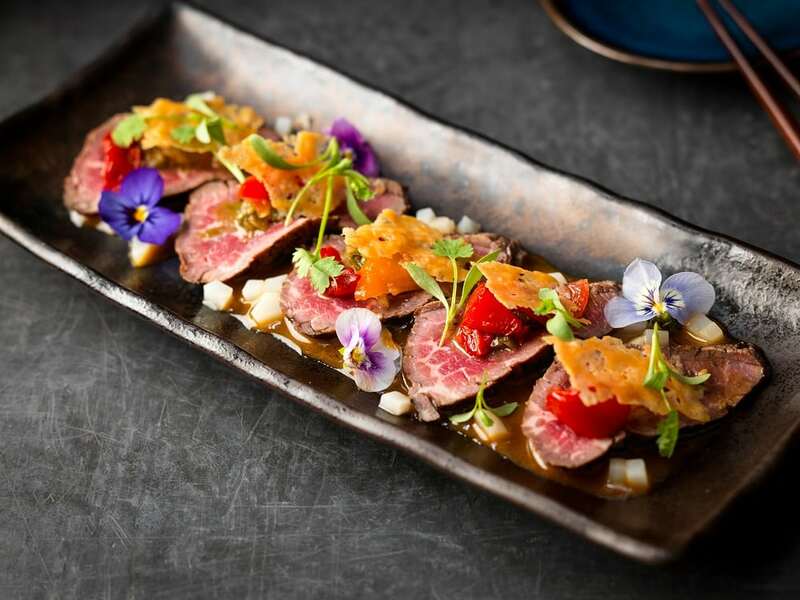 Much better was the beef tataki (£14.50), which – I strongly believe – celebrates one of the only good uses of fillet steak: serving it virtually raw, highlighting its tenderness rather than its inherent leanness and resulting lack of flavour. Having been ever-so-gently seared and sliced into paper thin slivers, the dish featured a somewhat peculiar contemporary take on the classic Asian dish. Instead of pairing with more traditional soy and ponzu sauce, this particular version was served with remarkably sweet chopped tomatoes and a parmesan crisp, surprisingly adding a slightly Italian twist to the dish. Even more surprising is the fact that, against all odds, it somehow worked incredibly well. Next, what the menu specified as a rack of lamb (£15.95), was actually a plate of two lamb cutlets. Both had a blackened outer crust which seemed on the surface delightful, yet the lamb would have tasted far better if the charcoal bark had not continued all the way through to the other side, resulting in outrageously overcooked lollipops from a lamb that had, alas, died in vain. It is undoubtable that, alongside an incredible wine list, Black Roe’s poke is very very good. Visit for a quick lunch of poke dishes (plus the beef tataki, perhaps) and you’ll likely leave feeling satisfied. Nevertheless, some selections from the grill menu do somewhat manage to blemish the rest of the experience. It’s also noticeable that many of the dishes employ excessively expensive ingredients that, like England’s national football team, seem terrific on paper yet fail to deliver when called to action. These particular ingredients, with perhaps some influence from the local area, also add significant amounts to the price of eating here. 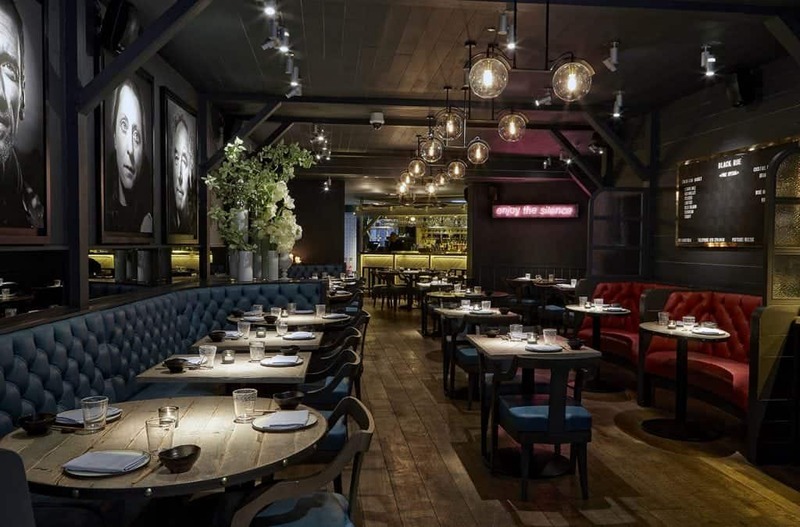 Black Roe Poke Bar and Grill can be found at 4 Mill Street, London, W1S 2AX.